This title is a nod to my alliteration-loving father! So now I know what this striking plant I photographed last year is! It’s a Cusick’s Camas (Camassia cusickii). I photographed the first image against a backdrop of the feathery stalks of Love-in-a-Mist (Nigella damscena) at Green Spring Gardens this morning. The Love-in-a-Mist flowers, another of my favorite blooms to photograph, should make their appearance in mid-May. I shot the second image last year at Green Spring Gardens after a gentle rain. In that shot, the water droplets add another element of interest and the color is a bit more saturated because of the overcast light. I posted the second photo on this blog last spring, but didn’t have a name to reference at the time. 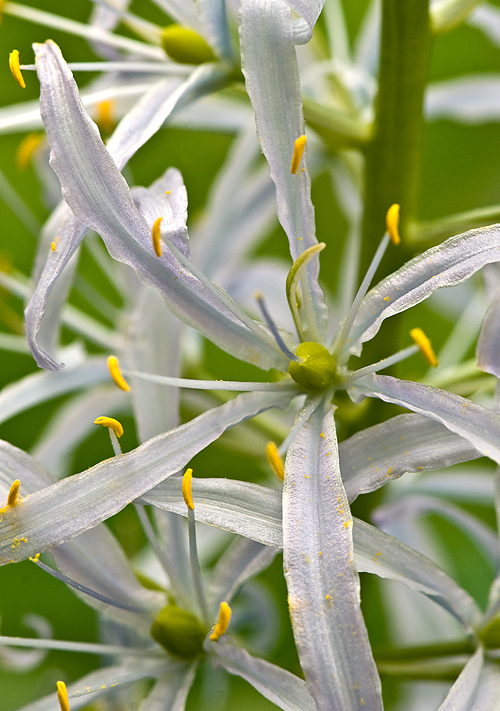 Most often referenced as a member of the Lily family, Cusick’s Camas was reassigned to the Agavaceae family by the Angiosperm Phylogeny Group (APG 11) after DNA and biochemical studies were done. The APG is an informal international group of systematic botanists who came together to establish a consensus view of the taxonomy of flowering plants (angiosperms). In my research, I find most sites reference it as being part of the Lily family despite the reassignment. This perennial plant, which can be propagated by both seed and offsets, was a food staple for Native Americans and settlers in the Old West. 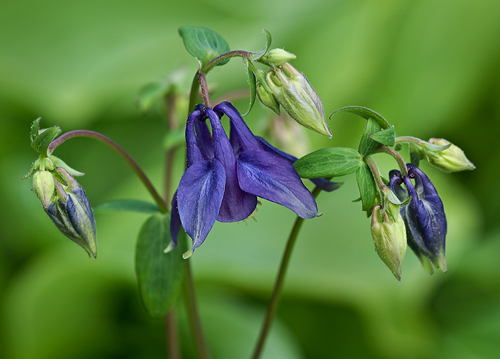 They emerge early in spring and the flower hues vary from pale lilac to deep purple to violet blue. Cusick’s Camas is one of the six types of Camassia. 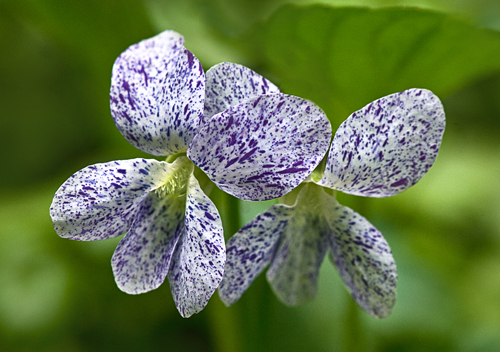 The rare and unusual Sister Violet (Viola sororia) ‘Freckles’, with heart-shaped evergreen leaves and tiny snow white blooms speckled with deep purple spots, is similar to a wild violet. 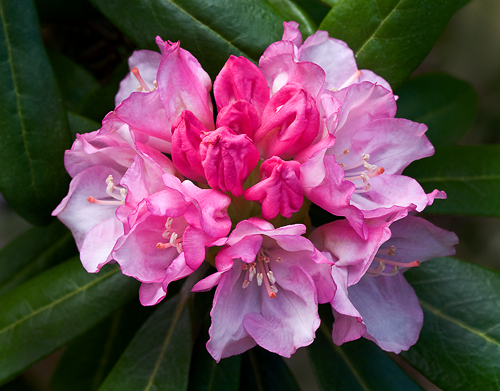 This hardy perennial likes well-drained soil in full to part sun (mine is in shade for a good part of the day). It’s a great plant for naturalistic shade gardens and it spreads by seed and underground rhizomes. I planted my first bunch a few years ago in an egg shaped wire sculpture perched atop a big urn. This year the plant has escaped from its cage and began spreading on the ground! 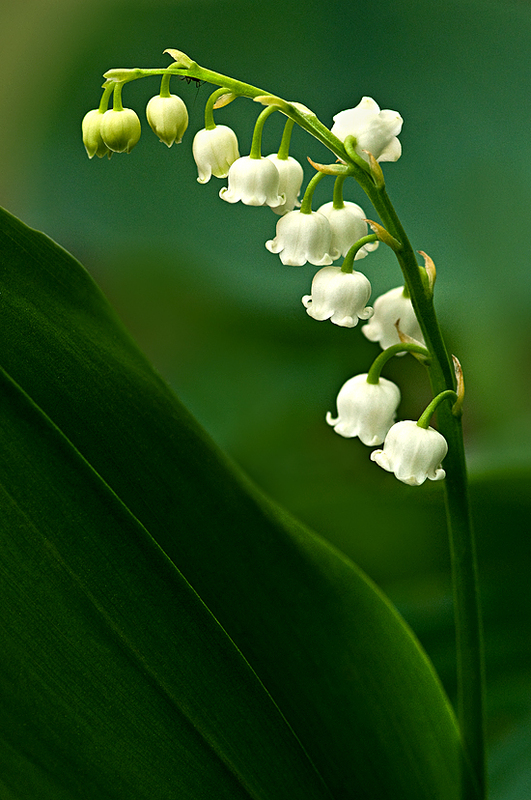 Lily-of-the-Valley (Convallaria majalis), with extremely tiny unidentified insect (can you spot him?). I didn’t see it until I zoomed in on the image in Photoshop!